What flying creature can hop, leap, and turn somersaults? Another hint: it can fit in the palm of your hand and weighs about the same as a penny. One more hint: its entire diet is blood. Desmodus rotundus, the vampire bat, packs a lot of punch into its 3-inch body. Using special 'thumbs' on its wings, it can push off into the air to perform somersaults or zip along at a flying rate of six to 12 miles an hour. The thumbs help it keep its balance on terra firma, too - it is the only bat that walks on the ground. The vampire bat uses echolocation to find its way, emitting a sound, inaudible by humans, that bounces off surfaces and reveals the presence of walls, branches, and other animals. It makes other, quite audible noises, too, from a soft purr to a scream or a shriek. The vampire bat drinks the blood of cows, horses, mules, pigs, chickens, and birds - up to half its weight in one feeding. A keen sense of smell helps it find its prey, and heat-sensing cells around its nose help it zero in on blood vessels near the skin - the easiest spots to reach. But the vampire bat is a polite predator. Often its prey does not even notice its bite, and the amount the bat draws - about two tablespoons of blood - is not enough to endanger the animal. Vampire bats share food with hungry roostmates, one of only a handful of animals to do so. (Hyenas, wild dogs, chimps, and people also share food.) Like cats, vampire bats groom themselves. 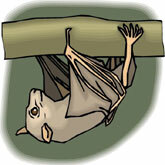 There's one notable difference, however: vampire bats do their bathing while hanging upside down.